People, and dogs, get into routines. Lily has this new routine of coming upstairs at night and falling asleep in our closet (while getting a nice, thick coat of dog hair all over my clothes). I find this routine absolutely adorable…until she decides an hour later to get up, shake (making a loud noise from her collar tags), and then sauntering across our bathroom floor, dragging her toenails the whole way. Then, she gets to the top of the stairs, right outside our bedroom, and lets out a big sigh. She then proceeds to hustle down the stairs, one step at a time, letting out a lazy, bulldog grunt with each step. This is her routine as of late. It’s a lot cute, and a little annoying. I now take off her collar before she even gets upstairs…limits the loud noises when trying to sleep, at least. Brussels sprouts and I, we’re in a routine, too. It involves olive oil, salt, and pepper. So good, but so, so boring. When I saw this recipe, I was half intrigued, half skeptical. There was no denying my doubts. Coconut and brussels sprouts? Believe it…it works. Just be sure to use unsweetened coconut. The buttery nuttiness from coconut is the flavor you’re bringing out, not a sweetness. But these flavors absolutely, positively work. Two of my favorite foods together? I have a new b’sprout routine! Will you have a new sprout routine, too? Preheat oven to 400 F. Spray a baking sheet with non-stick cooking spray. Add quartered brussels sprouts to a bowl and drizzle with coconut oil and toss to coat. Sprinkle with salt, pepper, and nutmeg; toss. Sprinkle with coconut flakes. Bake for 20-30 minutes until tender and beginning to brown. Serve immediately. Yield: 4 servings (about 2/3 cup each). Result: Nutty and buttery with a touch of coconut flavor. 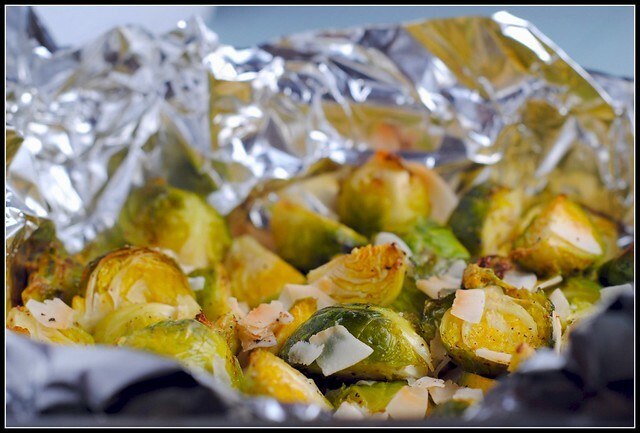 These are a fun twist on your average roasted brussels sprout recipe. 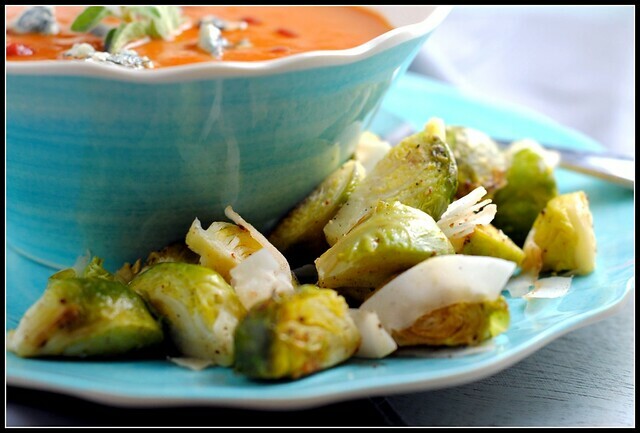 Simple to make, healthy, and sure to please any brussels sprout and coconut-lover! Enjoy! I live off routine. And I certainly support any routine that includes brussels sprouts. Sorry to hear about your computer. Remember when I went through that as I was writing my thesis for grad school?! It was a nightmare. Needless to say, I back up about once every other week. Sorry to hear about your computer! I had that happen to me in grad school so when I started grad school again, I started using carbonite – it is an online subscription (I think about $50/year – totally worth it in my opinion) and every time something is saved on the computer, it is backed up. You can even “sign into” your computer from any other computer to see your documents. Heather: THANK YOU! That subscription sounds nothing short of brilliant….so signing up!! Hooray to the end of a killer week! Sorry about the computer issues. It’s never fun… ugh. Ugh – the computer thing bites! Hope you have a better weekend! Our dog sleeps in our bedroom closet when Tony is in the hospital – but I never thought to take off his color because he shakes in there! 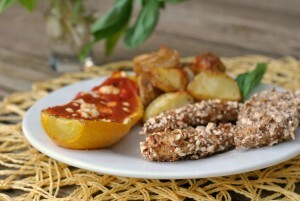 My MIL and SIL LOVE brussel sprouts – I’ll have to send them this link. I love brussels sprouts, and I always cook them in coconut oil. 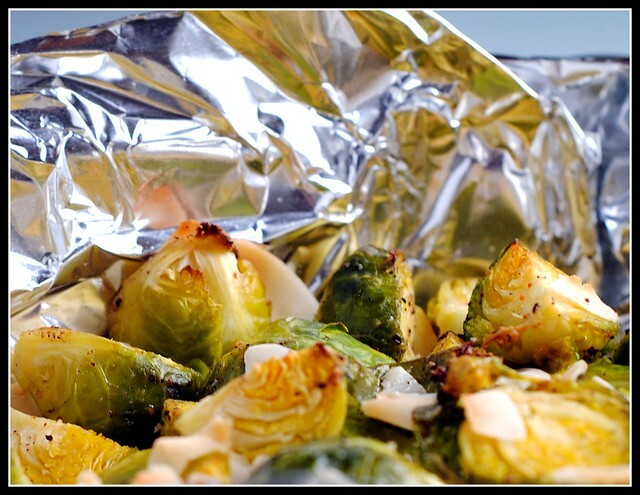 Coconut and brussels sprouts go perfect together. That story about Lily is freaking adorable. I love her. Lexie has a routine every morning of walking me to the door after I drop her off at my parents house. Unless my mom is staying home for the day. I don’t know how she knows the difference, but if she rcan somehow tell that my mom is in bed, and not just getting dressed or something. When that happens, she runs right past me to break into the bedroom and climb in bed with my mom. I’d be offended if it wasn’t the sweetest thing ever. Sorry about your computer! That is the worst. I need to back up more often. I did it forever ago. These sprouts look just delightful!! YUM! I will definitely be giving them a try since usually I eat them roasted. I have to say that I’ve avoided brussel sprouts my whole life… these guys though are the first ones to tempt me… I think it might be the coconut! But I’m actually tempted! So sorry about the computer, I know how hard that can be. I’m backing up! 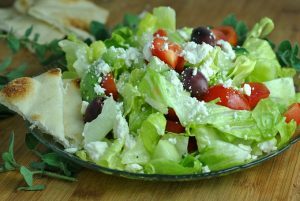 I would have never thought to pair coconut with Brussels sprouts but what a great idea – sounds delish!